Sorry I have been MIA for a few days. I had a long 14 hour flight to Tel Aviv, but I am here and settled in. I can't wait to tell you all about it! But in the meantime, I have Jess from Secrets of a Stay at Home Mom guest posting for me today. Jess is pretty amazing and someone I call a great friend. 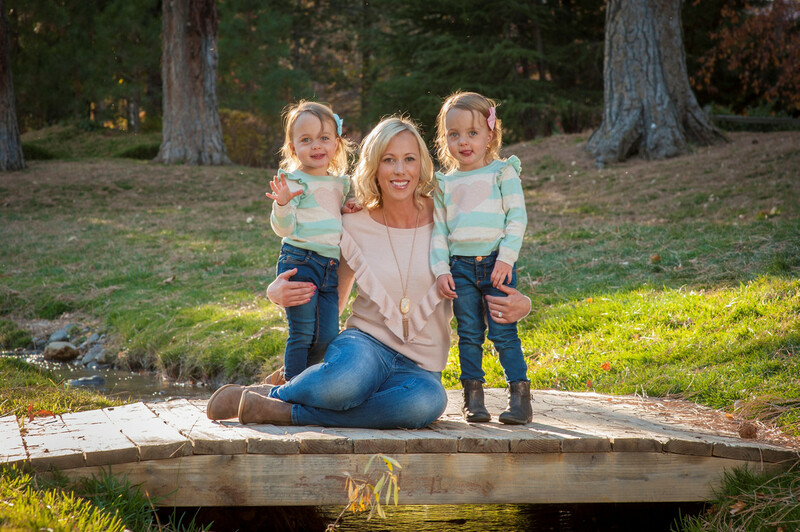 She has a handsome son, Cameron who loves Superheroes and a beautiful daughter, Emmy who is a spunky toddler. Emmy had a helmet just like my girls! So Jess and I bonded and the rest is history. Enjoy this post from Jess! Hi! I'm Jess from Secrets of a Stay at Home mom! I'm so excited to be guest posting for Danielle today. We "met" through our blogs a while ago and first bonded over sharing and supporting each other through our daughter's helmet experiences. It was so nice to have someone else who understood what we were going through. Since then we've realized that we have a lot in common and have become very fast friends. I asked Danielle what sort of post she'd like me to do and she was totally open to suggestions, so I gave her the option of a mommy post or a DIY post. She chose DIY, which I loved. I had so many ideas, but finally narrowed it down. I've recently changed up my children's bathroom and had numerous projects on the list to make it complete, so today I will be sharing a really quick and easy way to add just a little something to any room in your house. 1. Paint your canvases. I suggest using foam brushes because the paint goes on a lot nicer. I did one with a regular brush and it left a lot more streaks. You can see I had a trasher helper. She loved holding the paints and trying to touch the brushes. 2. Choose and print your pictures. I got mine through Walmart. I printed them as 5x5 prints because it was a bit cheaper than printing 5x7's. Since I was planning on my canvases being hung in a bathroom I took some cute pictures of the kids taking a bubble bath. 3. 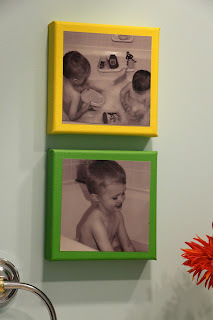 Once your canvases are dry (I did two coats) add mod podge and place your pictures where you'd like. Give them a few minutes to stick. 4. 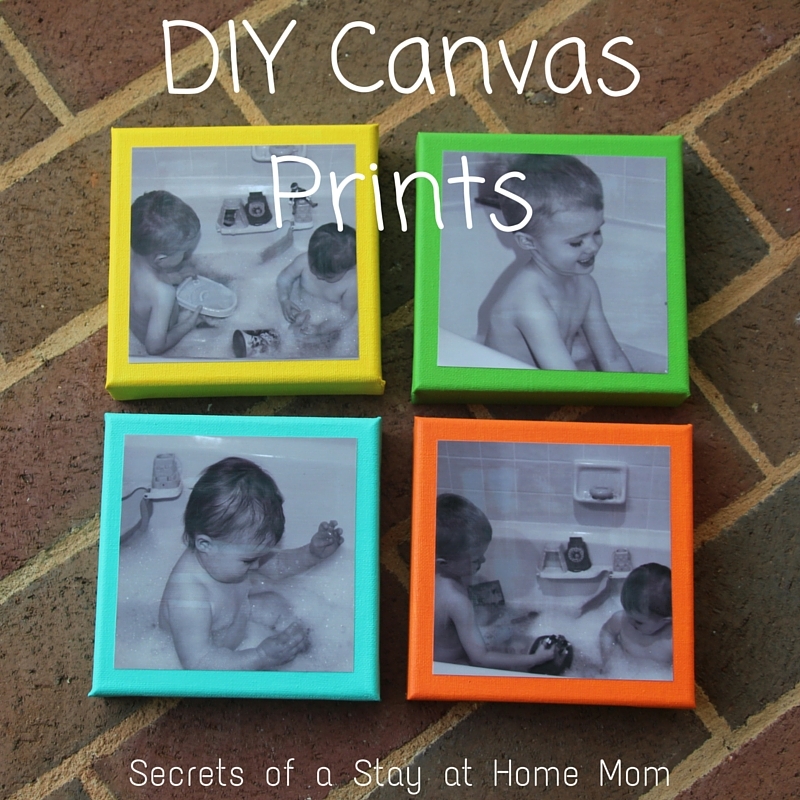 Once the pictures have had a few minutes to stick, carefully run mod podge and your foam brush across the pictures. It will make streaks, but they will go away once dry. 5. And you are finished! I told you it was easy. 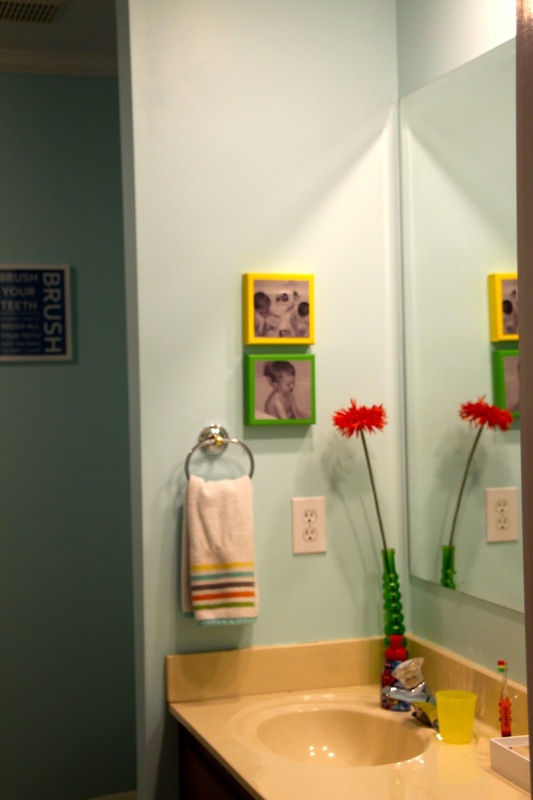 I love that it adds a pop of color to your walls without having to spend a bunch of money on painting whole rooms. 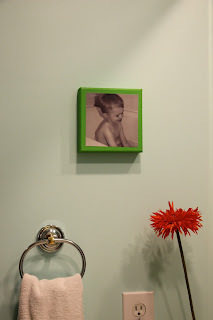 I hung mine in the kid's bathroom that I have been redoing. I probably would have hung them a little higher and farther apart, but there were already some nails in the walls so I just made it work. And there you have it. Now you can enjoy your handiwork and some pretty cute decorations. Thank you so much Danielle for letting me take over your little slice of interest. Have a great day y'all! Thank you so much for guest posting Jess. 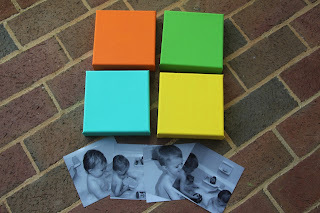 I can't wait to do this with my girls' photos! We have some great bath pictures I want to do this with! I love this! I've been looking for a idea for my boys bathroom. Going to hobby lobby today for supplies. Awesome post! So cute, Jess!! 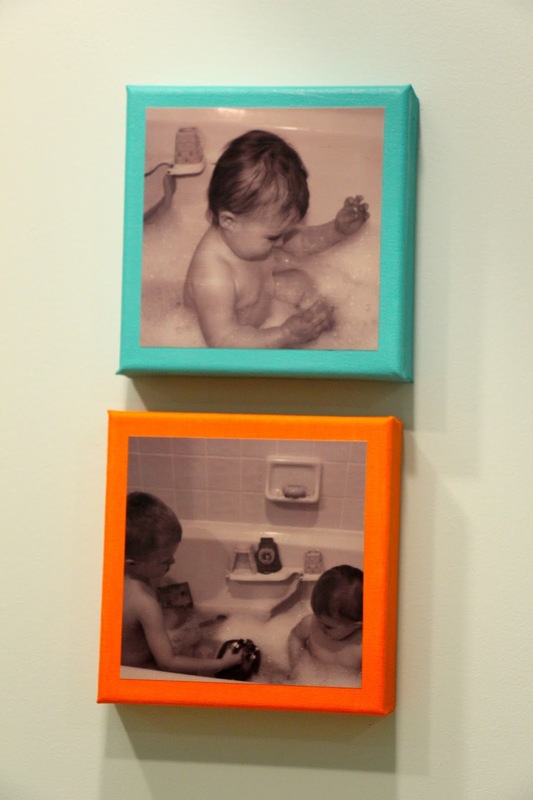 The bath time photos are perfect and I love the square size, too! Thanks Sarah! They turned out so well and add just a little pop in there. I love them! Love these!! Mod Podge has to be one of the greatest inventions ever! I agree! Mod Podge is awesome! Super cute! Great job, Jess! This is awesome, Jess! Ive never used Modge Podge before (shocking, right?!) Love how this is so easy and so cute! very beautiful blog . i love it . 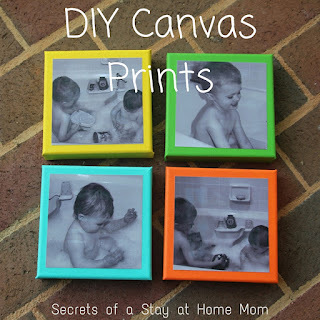 keep it up and upload about custom canvas prints.